Taken at RAF Fairford Air Show July 2008. No-one from the Manston Museuem was around at the time so am hazarding a guess that this is an ex-domestic pump for the RAF. All R.A.F.Establishments, and M.O.D. (Ministy of Defence)Establishments would have fire appliances to cover the eventuality of fire on their properties.So apart from the crash tenders which would attend crashed aircraft, appliance of this type are also manned to cover fire of a domestic nature at the base. Added by Pete Matten on 14 July 2008. It was a dog of a machine, slow and cumbersome! Its only saving grace was that it was easy to get around domestic sites as opposed to a DP2 or later on a Mk9. Like the Mk8 I think it was made to a budget! Added by John Stott on 23 September 2008. Added by Howard Harper on 22 November 2008.
Who did this unusual bodywork? Added by Petros on 25 November 2008. Petros, HCB Angus fitted the first of these for the RAF in the early seventies, this has a higher roof line which looks fibreglass. The MOD always went for a budget machine and they suffered for it, as opposed to many civilian brigades speed didn't matter as most sites were fairly small. The Bedford / HCBs that I worked with in other brigades were usually built to a better standard and had far better performance. Added by John Stott on 26 November 2008. Raf cosford had one of these, but if I remember correctly it was green? long time ago now! Added by Tim Wingham on 22 December 2008. Regarding Petes comment, Not all MOD sites had Domestic stlye Appliances, On RAF Airfields A vehicle from crashline would attend a DPI or DPII or even the Mk8, with local aurthority appliances backing up if required, small out of the way sites would have this type of truck and it only carried 100gall water.hated driving it as i had to stoop down below cab roof to see ahead. Added by Robert Ewing on 23 December 2008. Tim you are right, all ground equipment went matt green in the mid seventies. Airfield equipment had a narrow yellow stripe around the middle which could be painted out in time of war. It reverted to "proper" colours when the cold war ended. Added by John Stott on 23 December 2008. Added by Dave Crowe on 26 January 2009. Hi Bob..and I hated sitting in the back when you were driving it. It did get round MQ's ok though. Added by Brian Williams on 29 January 2009. We use to have one of these on the run when I served at RAF Troodos in the Cyprus mountains. From memory I think they were called the Firefly and were built by HCB Angus. I think they only had a water tank of 100 gallons, the theory was that a hydrant was never too far away. I have to agree with John Stott's comment, they were a difficult vehicle. Added by Steve Conde on 18 February 2010.
think it was there in 74/75ish???? Added by Bob Ewing on 18 February 2010. Added by Paul Davies on 19 February 2010. If memory serves me right, the Bedford TK was originally designed to carry 150 gallons of water but this proved to be too much of a load. so with typical RAF ingenuity the overflow was positioned lower down the tank resulting in a 100 g. capacity. With her 35ft HO ladder she would have been designated as a Pump (HO parlance). I was at Manston Crash and CTE for many years and we used a DPI or II normally for Domestics, though we sometimes had the old Bedford Domestic( 600 g) on line. I came across the TK when I was posted to RNAD Coulport when the RN ' borrowed' a couple whilst their 2 x new Bedford (HCB) Water Tender Ladders were being produced. Say what you like about the Min-Bedford she did the job and were later gratefully received by the Fire Crew at Faslane. Added by Colin Reeves on 17 October 2010. Added by Dave Cherry on 07 December 2010. 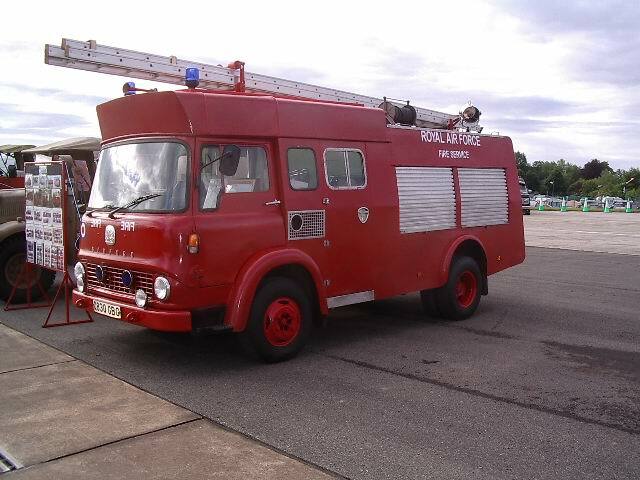 We had one at RAF Swanton Morley and it was indeed used for domestic fires, I knew as a Angus Industrial a it was a follow up to the more rounded Angus Domestic. Added by Dave Edwards on 29 January 2013. I was at Medmenham in '72, the SWO was warrant officer Montgomery and the OC was SQD Leader K.Davis. Wonder if you would know Bob Willis, cook in the sergeants mess or Ian Hunter. I worked in the officers mess. Added by Phil K-smith on 02 January 2014. Added by Ronald Murray Eng.Tech., MIET. on 21 August 2016. I remember one like this at RAF Sealand back in the 1970's when I was there then replaced by another Bedford TK. Added by Denni Parry on 22 March 2018.